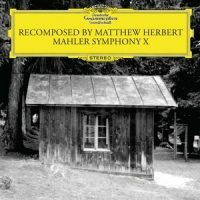 Matthew HERBERT: Mahler Symphonie X (2010). Deutsche Grammophon 06025 2734438 (1 CD) (http://www.deutschegrammophon.com/). Beyond the fantastic cover, I wanted very much to like what Herbert has concocted, as he is contemplating the experience of listening and ruminating upon the Adagio of Mahler’s unfinished Tenth. However, the setup is a bit like Dr. Seuss gone fin-de-siècle Viennese. Herbert says: “I took the work and played it out the window of a passing hearse, from the speakers at a crematorium, inside a coffin fitted with car speakers and had the opening viola line played at his grave.” Other sounds were recorded from within burial urns and at Toblach / Dobbiaco, Mahler’s composing hut in Italy. Courtesy of DG, Giuseppe Sinopoli’s 1987 Adagio recording is the patient on the table, and Michael Trabesinger is the solo violist who played at Grinzing, Vienna. As if to compensate for the elaborate setups, Herbert’s initial approach is cautious. But there’s a sequence which occurs (where else?) at the great dissonant pileup, which momentarily pulses as might a dance club’s floor. Herbert’s faded costuming presumes the original Adagio’s straining and cresting will carry the day. This release, and other items in DG’s ReComposed series, can be hard to find. At 37:29 this can be a pricey curiosity. 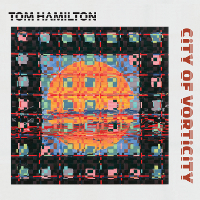 Tom HAMILTON: City of Vorticity (2014). Al Margolis (vln), Alan Zimmerman (perc, prepared hammer dulcimer), Peter Zummo (trb, didgeridoo), Tom Hamilton (electronic sound environment). Pogus P21085-2 (1 CD) (http://www.pogus.com/). We are treated to two versions of City of Vorticity, one with improvising musicians, the other as an environment to be listened to as is or to be incorporated into a performance with musicians. We hear the “score” with musicians first and then the “score” alone. The sound environment changes gradually, containing electronic and mechanical events. Random comparisons of the two versions don’t easily align, suggesting that the material can be manipulated during the improvisation (dynamics, moveable sections or tracks) or perhaps the improvised musician’s actions may be processed (amplified, filtered, etc.). Regardless, the content changes at an absorbing rate, and we have two versions of the same piece here. Well, maybe three should you choose to play along as you listen. 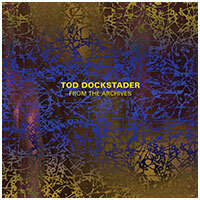 “From the Archives.” Tod DOCKSTADER: Var. comps (2005-08). Starkland ST-226 (1 CD) (http://www.starkland.com/). Starkland surprises us with a warm menu of lagniappes, perhaps things we were not meant to hear, but should marvel at nonetheless. Dockstader died in 2015, leaving a hard drive with some 4,200 sound files. Justin H. Brierley identified a promising group, and Thomas Steenland organized the 15 most compelling for this program. Paying close attention to ends and beginnings reveals a collection of in-progress etudes or skillful pencil sketches. Among what feel like unfinished gestures (Chinese Morf) and strong starts (Super Choral) there are complete statements with suggestive, punning titles (Anat Loop, Todt I and Todt II). The scale compares to movements within other Dockstader classics, such as the 1961 Apocalypse (Starkland 201), but the argument is more casual, less insistent. It’s best simply to play this without paying attention to the titles and where one piece ends and another begins. The given titles suggest solved mechanical problems rather than illustrations: Mystery Creak could just as well be Antwerp Sunset and thus profit from poetic framing. Created in the digital domain, we hear studio and ambient sounds combined and polished, short pieces that carry curious ideas from one place to another. Jóhann JÓHANNSSON: Orphée (2009-16). Hildur Guðnadóttir (vlc), American Contemporary Music Ensemble: Yuki Numata Resnick, Caleb Burhans (vln), Ben Russell (vla), Clarice Jensen (vlc), AIR Lyndhurst String Orchestra, Anthony Weeden (cond. ), Theatre of Voices, Paul Hillier (cond.). Jóhann Jóhannsson (pno, electronics, org). 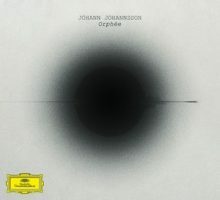 Deutsche Grammophon 00289 479 6021 (1 CD) (http://www.deutschegrammophon.com/). A 15-part album, loosely related, gently anchored with an ascending but unresolving chord progression. Constructed over several years, in fits and starts with the musicians at hand, Jóhannsson nevertheless creates a weary unity. These are desolate but grand pieces, like luxury cruise liners moving through the fog, where from shore we may briefly glimpse lights or hear snatches of a happy tune. Also incorporated are some non-secret numbers stations broadcasts, reflecting Cocteau’s Orphée, as well as adding a welcome mysterious electronic character to what is for the most part, mellow, repetitive and asymmetric. Jóhannsson also found himself in Berlin, whose intense history contributed to this sequence’s ethos. Most of these tracks are fragmentary, evading development beyond establishing a precious fractured mood. Some will want gravity so that this is all tied together, which the final track, a choral Orphic Hymn attempts, and others will be satisfied with the meandering self-absorption. 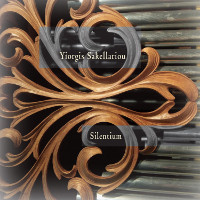 Yiorgis SAKELLARIOU: Silentium (2016). Pogus P21088-2 (1 CD) (http://www.pogus.com/). 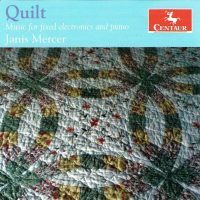 “Quilt.” Janis MERCER: Sound Portraits (2003-07); Friends…Flowers (2012); Mourning and Loving (2006-2011); Auctioneer (2007; rev. 2013); Citytudes (2005-07); Quilt (2013; rev. 2014). Centaur Records CRC 3417 (1 CD) (http://www.centaurrecords.com/). It’s easy for electroacoustic composers to baffle listeners with excessive superimposing. Mercer prefers to present lightly distorted material linearly, and manages to unsettle through unexpected juxtapositions. Several pieces (Sound Portraits, Mourning and Loving) incorporate answering machine messages. We know immediately that these messages were not intended for us, and so we feel uncomfortable eavesdropping as we witness memorials. This experience is made explicit in Mourning and Loving where a piano lightly comments upon the tape. With enhanced reverb suggesting a sacred space, Auctioneer makes explicit the call and response between bidders and parishioners. Indeed, the rapid prattle of the professional at the gavel suggests speaking in tongues. The Citytudes capture New York City and Amsterdam’s ambience. The title piece, Quilt, expands upon techniques used in the answering machine pieces, leveraging older family recordings to explore the imperfection of preservation. 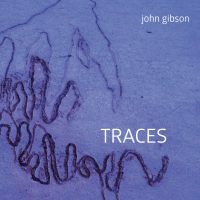 “Traces.” John GIBSON: Thrum (1998); Slumber (2006); Day Trip (2000); Out of Hand (2008)*; Driptick (2010); Red Plumes (2011)**; Blue Traces (2009)***. Michael Tunnell* (tpt), Brett Shuster* (trb), Craig Hultgren** (vlc), Kati Gleiser*** (pno). Innova 896 (1 CD) (http://www.innova.mu/). This program’s arc reveals a composer focusing upon details, such as the snap of Mahjong tiles being played in New York’s Chinatown (Day Trip). Familiar Schumann emerges from a suggestive haze in Slumber. Like an etude, Driptick is a clever three-part piece constructed from metronomes, dripping and ticking. The more recent pieces with instruments let their material evolve gently over restrained electronics: Out of Hand incorporates live trumpet and trombone in a varied landscape including electronic twittering. In Red Plumes, cello combines with subtle technology, whereas Blue Traces appears to be the inverse as a piano stirs up digital responses. 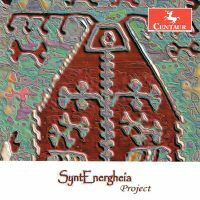 “SyntEnergheia Project.” Maurizio CARRETTIN: Energheia Nos. 1-7 (2013). Centaur Records CRC 3398 (1 CD) (http://www.centaurrecords.com/). Carrettin’s series is consistent and distinctively peculiar. I take it that we are hearing a threefold transformative sequence representing essential energy. Carrettin lists tools: Absynth, Cubase, Finale and a WaveLab plugin; however, the notes, perhaps due to translation, remain obscure. It is unclear whether there is a performance aspect, or if this was all devised in the studio. The work is not thematic, although there are sparkling pitched sequences that recall mid-century synthesizers. Carrettin leverages a metallic or bell sound with consistent angular harmonics. The ear quickly succumbs to this alternate universe’s spectra. The composer is also renowned as a flute player and teacher, thus it is possible to catch timbres that sound like that instrument but vastly overblown. Sometimes it sounds as if ring modulation was used, or that raw material passed through a specific distorting process. The uniformity in timbre is offset by hugely unpredictable rhythms and forms, and there is the suggestion that cause-and-effect is playing out in this series.